PS15 Standard Regroover 31inc 14-470 / BOWES TT 14-470. This high quality regroover has the rugged reliability of the more sophisticated PS15 Truckstar. 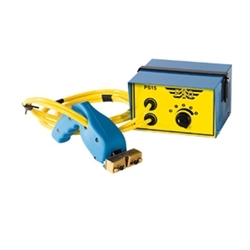 The PS15 Standard® is an excellent basic regroover featuring a dial knob heat control with 4 heat presets, large cutting head, comfortable, ergonomically designed handle, and has a 370 watt transformer. A safety feature prevents the block assembly and blade from heating up until contact is made when regrooving begins.